Top three finishers of the Ladies 10K L-R. Angela Fogarty 2nd, Dympna Ryan 1st and Martina Ryan 3rd. The club’s annual mini marathon was held this Bank Holiday Monday. This was the club’s 9th year hosting this popular event and this year there was an option of both a 10k race and a 5k walk. This year 84 runners and 60 walkers completed the two courses and the spectacular weather meant conditions were warm for both groups. There was a clear winner in the men’s 10k race in William Stevenson of Coolquil. William won the 10K in a time of 33.00 and was followed by Gareth McGlinchy in second place (35:57) and Stephen Flanagan in third (36:01). 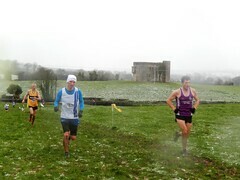 Liam Kelly finished in 4th position, followed by John Fogarty (5th) and Liam O’ Donnell(6th). In the ladies race Dymphna Ryan was our comprehensive winner in a time of 42:17. Dymphna Ryan (Dundrum AC) is our current record holder and ran very well today in tough conditions. Angela Fogarty had an excellent race to finish in second position in a time of 43:15 and Martina Ryan (Thurles) was third in a time of 45:28. Laura Carey finished 4th followed by Paula Mills (5th) and Charlotte Jones (6th). In terms of our club members we had some strong performances in the female and male categories. Brian Carroll ran very well to finish in 8th, Richie Daly came in 14th place followed by Louis Everard in 18th and Thomas Moore in 24th position. They were followed home by Martin Kiely in 27th position. In the women’s event, Angela was followed home by Sharon Cantwell in 32nd postion, Sharon Kiely in 39th, Francis Long in 41st, Lisa Quinlan in 44th, Catherine Dunne in 48th, Bernie Walsh in 61st, Pauline O’Connell in 64th, Della Hunter in 67th and Breda McNamara in 69th. Well done to all these excellent athletes in what were very tough conditions for this 10k competition. The 5k walkers took to the Burma route and well done to all who walked this route. The day saw athletes of different fitness levels and ages compete alongside one another for a thoroughly enjoyable day. A special thank you must be paid to all the committee members and volunteers who worked tirelessly to ensure today’s success. From organising the carpark, registration, kitchen staff and provisions, stewards, starters, water station supporters and the support car, all our volunteers deserve a massive thank you. Well done to everyone who attended this event and thanks to everyone who contributed so generously. On Saturday and Sunday last, 5 athletes representing the club travelled to a sun soaked Ennis for the Juvenile Track and Field U9 – U13 competition where the best juvenile athletes from Munster competed for prized podium positions. It was Billy Gleeson who made the podium winning a silver medal in the Boys U10 500m. Such a wonderful achievement! He also competed in the 60m sprint where he finished 6th overall in 9.59. Niamh Gleeson qualified for the semi-final of the girls U9 60m in 10.51 and unfortunately did not make the final 8. Olive Spillane-Leane ran the U9 300m in 1:03.11. Both girls competed in the U9 long jump where Olive finished 9th with a jump of 2.94m and Niamh finished 13th with a jump of 2.73m. Sarah McGinley competed in 2 field events – throwing 7.77m in the U11 turbo javelin and jumping a distance of 2.74m in the U11 long jump. Saoirse Doran competed in the U12 600m where she finished 17th overall. A huge congratulations and well done to all 5 athletes who competed. For some it was their first Munster outdoor track and field championships and it certainly won’t be their last! The Leinster Senior Track and Field Championship took place this Sunday in Tullamore Stadium. Sarah Healy and Adrian McGinley (Templemore) guested in this event (prior to the Munster Senior Championships) in the 400m and 800m events. Sarah clocked a 66 second 400m while Adrian ran 2.06 for his 800m. The gym has now closed for the summer break. The gym will re-open in the autumn. The club will host the County Community games next weekend. This is a great event for the club to host and will see athletes from all over the come to compete for a place in the national final. This event will take place on the 10th of June in the sport’s field. Volunteers available on the day would be welcomed.